I’ve been making marmalade recently (planning on entering some in the county fair), playing around with recipes trying to find my favorite, I should have a post with some recipes soon. One of them, lemon raspberry, never really set up. It was more like lemons and raspberries in syrup. Probably didn’t have enough seeds in with it when I made it. Anyway, I was trying to think of a recipe for bread at the same time as I was trying to think of what to do with the lemon raspberry in syrup blend. Then it hit me, make bread with it. So, I just decided to modify my high hydration sourdough recipe to use marmalade for much of the moisture content. In this case when life gives you lemons, make lemon raspberry marmalade, and when that doesn’t work… stick it in bread. Just as notes, this one again uses less starter even though the recipe makes the whole amount, you only use some. Also, if you don’t have a really think marmalade I’d suggest compensating with a bit more water and a bit less marmalade. This bread came out of a rather failed attempt at a bread with roasted pumpkin in it. I’d seen a bread online somewhere with slow roasted pumpkin in it, but I guess the pumpkin I used wasn’t that good because it just came out with a really bitter and not very positive flavor. 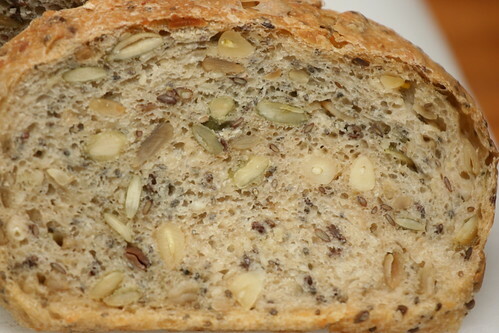 However, the sunflower and pumpkin seeds in it did lend a great flavor (if a bit overpowered by the pumpkin). So I decided to take that idea and expand on it a bit. Sunflower, pumpkin, sesame, chia, and flax seeds and pine nuts. In addition to that, I used toasted sesame oil to add even more of a toasty/nutty flavor. The one mistake I think, was not using enough water with the chia and flax seed. 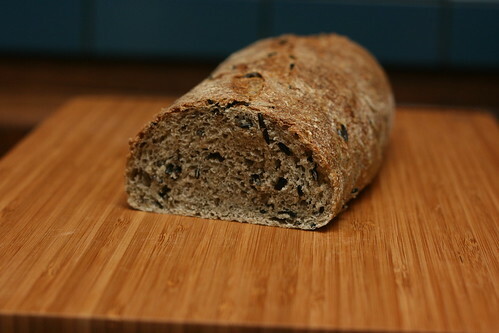 So while the recipe will include the amount I used, I strongly suggest adding another 50% water to the flax and chia seeds, I think it would help the finished bread a fair amount. I also used a smaller amount of starter in this recipe, because I forgot to make enough and was making another bread… Way to go me! Been a while since I’ve posted! Largely because I haven’t been making much new lately, just remaking things I’ve made before. 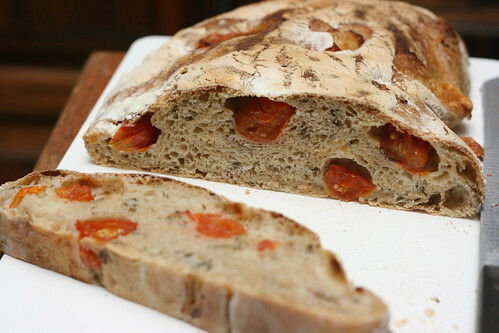 I do have some new variations on a couple of the recipes that I should have up soon, and a few other non bread related projects. 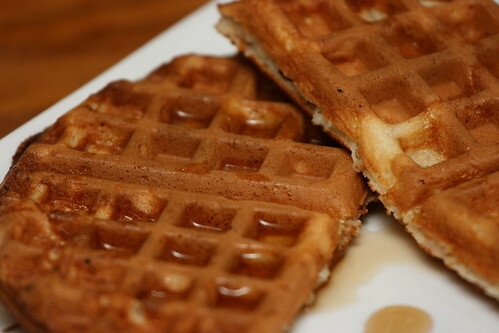 But for today, just my spin on a yeasted waffle recipe from the LA Times. 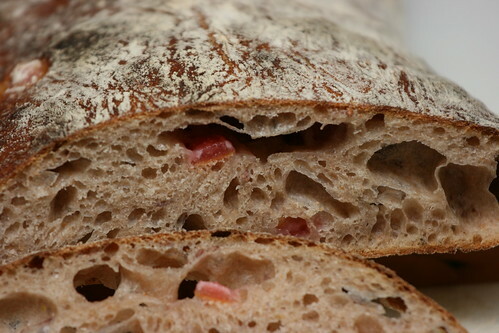 I had been wanting to try this recipe for a while, and when I finally decided to make it I had some extra starter so I figured, hey, why not make it sourdough? It turned out pretty tasty, and quite fluffy waffles. 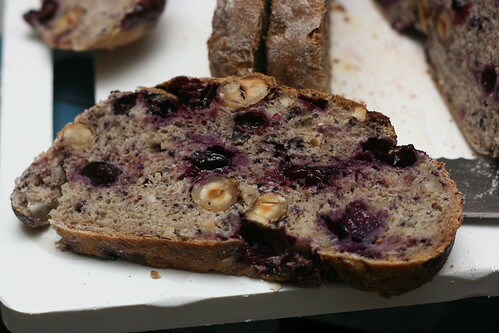 I decided to experiment a bit with this blueberry bread, and I increased the amount of hydration coming from the fruit. That turned out to be a delicious decision. That could just be because I’m so partial to blueberries, but I choose to believe it means a bit more than that. I actually meant to make one other modification, I meant to make at least some of the bread with a bit of lavender in it as well, but it totally skipped my mind when it came time to actually make the bread. I’ll have to remember that for a future variation on the bread. 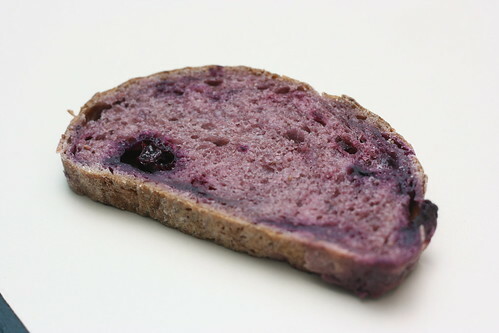 Which will certainly happen, because I will definitely be making this bread again, and again, and again… Mmmm, blueberries.